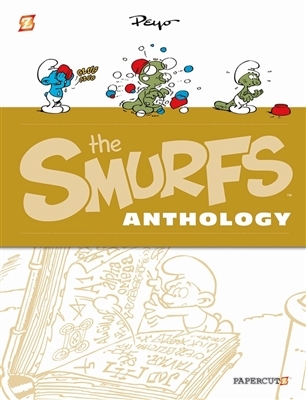 Another iconic Smurf, The Smurf Apprentice, gets the Anthology treatment! A smurf wants to emulate Papa Smurf, and decides the best way to do so would be to practice magic. So, the smurf sneaks into Gargamel's lab and steals instructions for a magic potion. The smurf foolishly drinks the potion and is turned into a monstrous lizard that all of the smurfs fear. Can Papa Smurf create an antidote? Or will the Smurfs be seeing green for the rest of their lives? The Smurfs have delighted us all with their silliness, bravery, heroism, and heart for over 50 years, and now we finally have a definitive collection of Peyo's original comics to see where it all began.